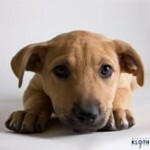 Share stories about your animal by completing our form, on the left side of the home page. Tell us about them and add a picture, they are worth a thousand words. It will be posted on the site for everyone to see. Boss, my golden/lab mix had such an exciting personality.During the 17 years of her life she was my best friend in the world. Her favorite pastimes included chasing the tennis ball, swimming, taking me for walks and chasing the tennis ball. When she was just 12 weeks old she learned to swim and chase the tennis ball at the same time. She also had a game called 2 toys, where she’d manage to fit 2 tennis balls in her mouth at one time. The thing I miss most about Boss is her greeting parade she did when people came to visit. It included carrying one of her bunnies and circling thru the kitchen, dining and living rooms. Everybody loved Boss. She was a huge part of the extended family – Debbie, Boston, Mass. Bessie has an adventurous soul. She would never stop until her mission was accomplished. She was also a very strong willed girl. She almost died at the age of 3 and came back. Then she got 3 different cancers and an ulcer. She fought all of that for about 3 years, until her little body could not take anymore. 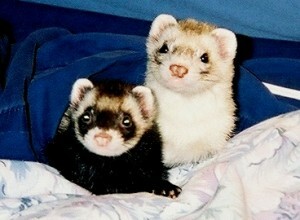 She is now at peace with Herb, her mate for life. I know the two of them are happy being together again. They will be missed more than they will ever know!!! 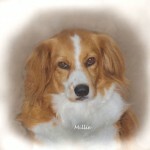 My dog Millie I have had 3 dogs.. and they of course are important members of my family. All three are rescue critters and very interesting mixes.. but this short story is about “Millie”.. she was a combo of Aussie Shepherd..Pomeranian.. and Nova Scotia Duck Toller! Yup.. really a cool dog! A couple months ago at age 5 1/2 she had a seizure.. then 4 more in one day. I took her to several vets in town with no clear diagnosis.. then she went into a coma and I rushed her three hours to a neurological vet clinic in Tucson.. They gave me an estimate of $4000 just to diagnose what they believed would not be curable . 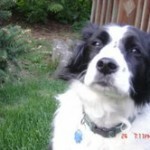 I lost this wonderful dog.. it hit me harder than anything I can remember, and I am tearing up as I write this.. I still have two wonderful dogs but the loss of Millie has made me feel more lonely than I have ever felt. It may be hard for some to realize just how important animals can be in our lives.. and how important we are to them as well. There is no way Millie can ever be replaced.. and no way that I will even try. 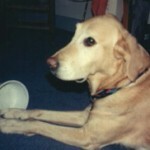 But I am sooooo lucky to have had this special dog.. but she left much to early in her life. I miss her so much, and so do my other two dogs. 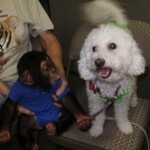 Re: Your Monkey Blog Did you ever wish your dog had a friend like this? My boy Scoob is an 11yr old greyhound, retired after 3+yrs of racing and the best k9 companion I’ve ever had! He’s been a wonderful ambassador for the Racing Dog Rescue Project and a Pet Therapy dog for the Humane Society of Sarasota County. 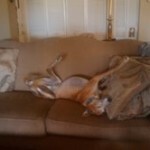 The picture pretty much says it all, now, he’s truly a retired greyhound and loving his life. I do love my boy. All Better When I feel down & out, my puppies make it all better. Dylan, an Oz Shepherd-Dalmatian mix, was rescued by an observant witness to the insane cruelty inflicted upon this docile creature by a sad and unconscionably brutal man.Dylan is incapable of violence. However, woe betide any person whom he may have perceived a possible foe with a wish to inflict harm on those whom Dylan had chosen to guard.I will always wonder what compelled him do that which was decidedly against his character. 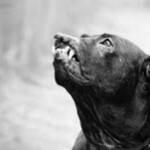 There are breeds and individuals who are more than happy to oblige with a full show of teeth and temper, accentuated by a loud barking cacophony, even menacing snarls. Something that Dylan found so unnecessary. When he thought his charge(s) may have been threatened either by its own stupidity or by a possible foe, Dylan silently placed himself between the two parties and smiled at the Other. His smile showed pretty much most of his big and healthy teeth. Could it be that his good-natured grin was misconstrued as a silent threat? Dylan’s first owner was cheap. There would be no wasteful spending of hard-earned dollars on dog food in that household! The man’s habit was to release Dylan from his short restraint and push him out onto the street to forage for food. The nearest restaurant was a few miles away, but I don’t expect Dylan cared. He had just spent the entire day tethered by a short chain to the stairs. Where was the logic in the latter, I wonder: how was Dylan supposed to do any ‘guarding’ within such a short perimeter? I guess that’s why the word idiot had to be invented. The patrons of the restaurant quickly noticed the quiet black and white creature grateful for every morsel that he was offered. Dylan soon learned how to extract the contents from many-a doggie bag. His most effective trick was to stop the patrons leaving the restaurant by sitting down at a respectful and unthreatening distance away from the door. His huge eyes moved in a clearly understood way: from the exiting person to the bag in the patron’s hand. He seldom failed to score. Following the feast, he always returned to what he perceived to be his home. Word had spread in the tiny community that Dylan’s owner was a man with a nasty temper who, rather than stand up for himself, took out his frustrations on an animal determined to stand by his owner. In time, the decision was made. The rescuers carefully chose their moment. One day Dylan was captured on his way ‘home’ and taken to a private shelter ran by a caring woman who put Dylan through an intensive course of TLC. Dylan’s favourite treat was to be allowed on the leather sofa. I often wondered why he thought the privilege such a luxury… I found his mug on the shelter’s website. After some careful vetting, Dylan was entrusted into my care. Following the initial, more than quadruple paws-length of measuring and assessing, the cats accepted Dylan unconditionally. Dylan’s love for the cats was unconditional, too, but he preferred that they kept to themselves. The fact the Radja likes to cuddle up was sometimes tolerated. More often that not, however, Dylan was more than happy to leave his personal huge cushion to Radja, and lie down on the floor nearby. At first, Dylan had a seemingly insurmountable problem adapting to the incomprehensible idea of inside-for-the-night regime. I had no option other than to leave the door to the garden ajar, so that he could leave and enter at his leisure. Within a couple of weeks the weather changed to very cold and very wet. The only sensible thing to do was to stay indoors, where a large comfy overstuffed cushion was placed on the dry side of the sliding door. A short time later, Dylan decided to make the big move and followed the rest of the domestics upstairs for the night and wouldn’t have had it any other way from then on. I was relieved to be able, once again, to lock the ALL the doors for the night. When MiouMiou gave birth to her first and last family, Dylan was beside himself with excitement. Ever so gently, he picked the tiny newborns out of their lair in the far corner of the closet hidden by the fashion statements. He peered at the wee ones as they lay between his paws, directly under his powerful jaw. The look in his eyes, wandering from MamaMiou, to me, to the babies was a sight to behold. Oh, to have been able to know what was going thru his head… He may have been casually ok with the other, grown cats, but the newborns became a fascination and obsession. As they grew up and out of their nursery, the wee ones accepted Dylan’s attention as perfectly normal and due them. One day, at the ripe old age of three months, they decided to climb up to the top of a fully grown blue spruce, Dylan parked himself at the foot of the tree and did not let the little ones out of his sight. Did a silent exchange ensue following the harrowing two hours he had spent waiting for them to come down? I’ll never know, but the wee ones never did it again. Never to those heights, that is. 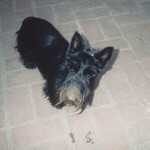 Dylan was with us for seven wonderful years. The abuse he had suffered cut his life short. I have no doubt that he was cheated out of at least three, maybe five years. I hope that the Man-Idiot will soon come to understand that the manner in which we treat the world of plants and animals around us is a reflection of our own humanity. Or lack of it. Our own survival depends on knowing the difference. 11 years ago, my life was blessed when Sarah walked in to it. 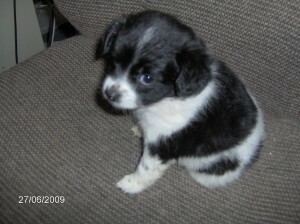 I bought her and her sister Kaitlin from a breeder in Reno, NV. I named Sarah after the Duchess of York. The similarity? Large presence, big personality. When she walked in to the room, you knew Sarah was there. Very loud, animated, friendly, expressive. Sarah was definitely the alpha, but she was also very sensitive, and could read your mood. She wanted nothing more than to make you happy and smile. And wherever she went, she accomplished that goal. People who met her never forgot her. She believed everyone was her friend, and especially loved tall, dark haired men. They could be two blocks away, and she would start announcing to us who was approaching, and how she needed to go visit them. Two years ago, she had an exam and it was determined she had cancer. Immediately, we started having chemotherapy, and within seven treatments, the cancer was cleared (Thank You God)! About six months ago, something just didn’t seem right with Sarah, so I took her back in, and not only had her cancer flaired up again, but now she had a kidney tumor. If we treated the cancer, it would shut down her kidneys. The only alternative was to focus on the kidneys. Every other day, I took her in to have fluids pumped in to flush her system of toxins. The moment we got out of the car, she would start backing. All the clerks in the clinic knew her voice, and as soon as we walked in to the lobby, everyone said, “Hi Sarah! We heard you outside!” You could see the smile on Sarah’s face. 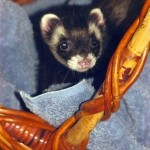 Sarah traveled to the Rainbow Bridge two weeks ago Thursday. Her sister Kaitlin, her brother Sean, and her kitty sister Claire miss her terribly. I have never had a fur child who was so much like a person. Her presence is so sorely missed in this house. We all love you Sarah Lee! I know you are here in spirit. We hope you are having fun chasing squirrels, and flirting with all the handsome men up there!! I hope Camie and Scottie greeted you when you got there! Give everyone kisses Missus! Story title: Mr. Hissy Meanest Cat on the Block Story: Hissy was well known in the apartment complex and adjoining neighborhood in Pleasant Hill, CA. He was known to fight anything or anyone who got near. And if was usually an ambush. I once saw him hissing and chasing a group of terrified first graders who were walking down the path toward home. They had done nothing to harm the cat, he just burst through the bushes snarling and hissing. Hissy, then known as that damn cat, terrified all animals in the complex, even the raccoons. Just such a grumpy animal. Everyone talked of catching him and taking him to the shelter, but everyone was afraid he’d attack them. One day, my once stray cat, Mookie came tearing across the patio railing a look of shear terror in his eyes. I happened to be standing at the door in time to let him in…Hissy was right behind. I was in the perfect position to catch him by the scruf of the neck, hold him up (he was so startled he just looked at me as he hung like a kitten in mama’s mouth) and said in a loud and firm voice, “STOP IT”. Then I dropped him to the patio where he looked at me with a look that said, “I can’t believe that just happened!” The next day I was eating my breakfast on the patio when Hissy lept over the railing and started toward me. I feared the worst. I stayed where I was, he walked right up to me, gave me a long look (I was gulping as I figured this was it, I was going to be a scratched and bloodied mess) and jumped into my lap and started purring. I was amazed! My cats who, seeing Hissy jump over the rail, had gone inside the doorway, were appalled! Over the next few days Hissy and i visited. One day I invited him in to the absolute horror of especially Mookie. Hissy hissed at everyone, and I picked him up by the scruf, said NO and put him back down. He calmly walked past everyone, jumped in the rocking chair and fell fast asleep. 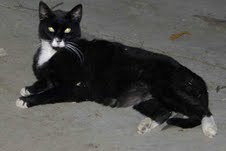 He was neutered and began the impossible task at times of learning to live with the other cats. When I moved from CA to Idaho a friend took two of my cats in one UHaul and I took Mookie and Hissy with me. They still did not get along, but because they were harder to handle they had no choice but to go together. I had them sedated so the trip wouldn’t be so miserable for them. They kept their distance, eventually a very mellowed out Hissy went behind the seat and fell asleep. Mookie staggered up behind my head and drifted off. It wasn’t long before Mookie kept twitching. I couldn’t figure out why until I pulled over and peered over the seat. Mookie, still pleasantly under the influence was dangling a paw over the back of the seat, Hissy, also drifting on a cloud of calm, was lazily batting at the paw…purring away. When I got to my apt., the boys, still partially zoned out, were put in the closet while the movers brought things in. I didn’t know how that would work, but to my amazement Mookie and Hissy came out of their big move and closet adventure the best of friends. Always together. 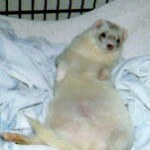 Sadly, on Dec 30 Hissy lost his battle with feline diabetes. Mookie still looks for him and we all miss him dearly. The meanest cat on the block had become one of the most loving, wonderful animals I’ve ever had…my dog Robin and the neighborhood squirrels disagree, but to his kitty family and me we miss him every single day. His story is a lesson to all, that given a chance and a little love, even the meanest cat on the block can change. Story: While working at a local skilled nursing facility, I sometimes brought my dog Kiddo, a 4 year old Shih Tzu, in to visit with the residents. On one of those days, Kiddo was sitting on my desk. A relative of one of the residents asked if I would bring Kiddo in to visit with his Mother who was nearing death. He said that his Mother had loved dogs. As I did not know how Kiddo would behave, I asked permission to accompany them. As we entered the room, this lady was ashen gray in her face, lying in bed in a fetal position. I put Kiddo down on the bed, hanging onto his leash just to be certain (he was only 2 at the time). Kiddo approached her face, licked it, and settled down next to her, as if sensing that she was very ill. Within days this lady bounded back and Kiddo would often visit her on subsequent days. I would like to think that Kiddo is the one (more than medical care) that brought her back. Story: Cindy is plagued with painful ear infections and needs two inner-ear ablations (removal of the inner ear). This procedure is very costly, about $1800, and can only be done by a specialist. 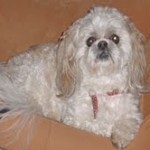 Cindy is seeking very special Guardian Angels to pay for her operation. Cindy resides at Cat Depot while awaiting for the perfect family to adopt her! Cat Depot is a non-profit, no-kill feline rescue, adoption, education and resource center in Sarasota, FL. 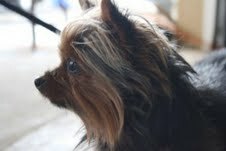 Story: In June of 2007 we went to meet a Yorkie that we were considering adopting. The dog was nice but didn’t really take to us. Then they brought out her sister. I was sitting on the floor and Amanda ran straight to me jumped into my lap and began licking my face. We didn’t choose Amanda she chose us, and she loved us unquestioningly from that moment on. At bedtime the night we brought her home she curled up in a chair and was ready to sleep there, when she found out she was invited to come up stairs and sleep, in the bed, with us you should have seen that little tail wag, she knew then she’d made the right choice. Before coming to live with us Amanda had lived with many other yorkies in a very nice house, but she never got out and about. Her life with us was very different and she loved it. She didn’t care where we were going or what we were going to do, as long as she was with us she was happy. She had unyielding faith in us and trusted us completely. The first time we took her out of town, to my parents, I came out of the bedroom dressed up to go out. She looked up at me, over at my Mom sitting on the couch, came over gave me a kiss and went over to curl up next to my Mom. She knew I’d be back and that I was leaving her in good care. Amanda was the inspiration and the drive behind Fido’s City Guide. She struggled with her weight everyday, so finding dog parks and places to walk and run, were a must. She loved meeting new people and would hold royal court on the tables at the dog parks after her walk. Attracting attention and letting people know about Fido’s City Guide was not her job, it was her life. She enjoyed meeting people and wanted them all to pet her and hold her. In July of 2009, we found a very frightened dog hiding under a car in front of the house. Amanda stepped off the curb and talked the frightened little Chihuahua-terrier mix out. 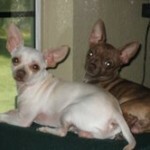 Lady quickly became Amanda’s best friend and protector. No matter how many dogs there were to run with at the park Lady would check on Amanda every few minutes, to make sure the other dogs weren’t bothering her little ’sister’. 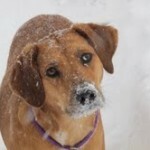 Amanda never had a lot of interest in other dogs, she didn’t dislike them she just preferred people. The other dogs loved Amanda. As soon as she entered a dog park, the other dogs were there to greet her, or maybe they just wanted too make sure she was really a dog. At only 6.5lbs she was almost always the smallest dog in the park. Amanda enjoyed her life with us to the fullest, and we promise to dedicate Fido’s City Guide to help other dogs (and their life partners) to enjoy their time together as much as Amanda did. Mandy we love you and miss you so much. 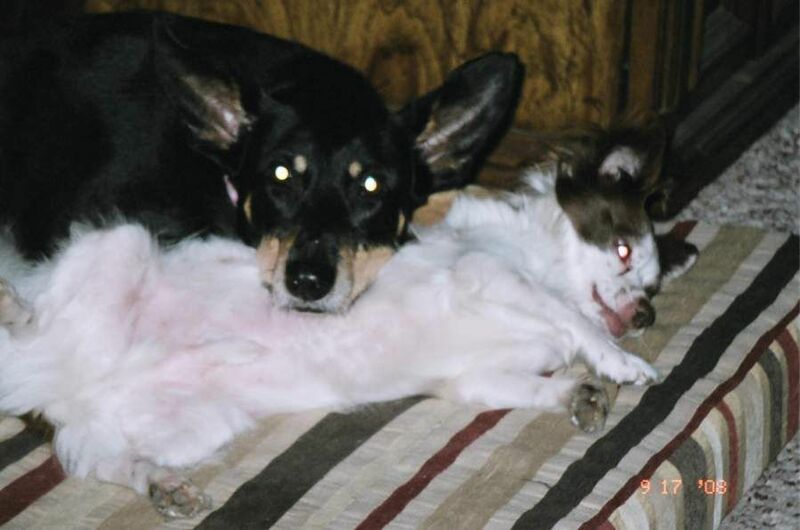 Story: It grieves me that Isis, my wonderful 13-year old Dobie mix passed away Saturday morning. My personal goddess had a massive heart attack at the vet’s office. She’d been slowing down over the past few weeks (age and fatty deposits with do that to you). The vet was monitoring her condition every two weeks. 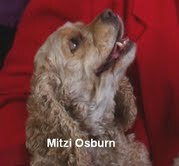 On Friday Isis , Hermes and I had a phone session with Terri Steuben – our amazing animal communicator. She told Terri that her arthritis was acting up so she wanted to go on shorter walks and that I should keep giving the “orange pills” because they helped her pain. Her fatty deposits were just that – no cancer – and in general she was feeling pretty good for a dog her age. I’d been complaining that she kept lying down in doorways – and especially in the dark I wouldn’t see her and I’d trip over her and sometimes yell. So I wanted to find out why she was doing that. Seems it was cooler there – she was getting a breeze and liked it. She’d move when I told her too – but would settle back down in the doorway – much to my frustration. But now that I understood why she was doing it – I could deal with it. She and Hermes both said they didn’t want me to travel – they wanted me home with them. And they also said that I was “finally” getting it right and treating them the way they should be treated. I guess they have me very well trained . She had a good dinner and walk that evening and I left the house for a massage. When I returned at around 8:00 PM she was very lethargic and didn’t want the treat I offered. That’s a REAL red flag. I’ve often said that I’ll know when she’s on death’s door if she’s not eating. She stayed on her pillow in the family room and didn’t want to get up to go out later that night – even when I put on her leash and collar for encouragement. So I spent the night on the couch to be near her. At around 7:30 AM on Saturday I heard her struggling to get up. I lifted her so she could get her feet under her – but she collapsed. She didn’t yelp in pain when I tried to lift her – but I could tell she was hurting. Her eyes seemed to be pleading with me. And her stomach seemed a bit bloated. So I threw on some clothes and ran across the street to get my neighbor to help me lift her into the car. She was a dead weight and I just couldn’t do it on my own. At that point she was lying on a area rug so Bill and I lifted the rug and got her and the rug into the car. The vet techs met me outside with a gurney and rushed her into the facility. In the meantime – I’d reached Terri and she said that Isis was in a lot of pain in her back and there was something going on in her stomach – some kind of blockage. Dr. Sullivan was examining her and we were discussing whether to get her to a specialist or let her go. She spasmed on the table and had a heart seizure. He checked her heart and at first we thought she was gone. Then she kept seizing and it turned out her heart was only beating once every 30 seconds. Rather than put her through any more trauma – I asked him to euthanize her. I held her while she passed and told her how much I loved her. I cried all the way home to get Hermes and bring him back to the vet’s office so he could see her and say goodbye. Just before her surgery last year – she’d told Terri that if she didn’t make it she wanted to be cremated like my other dogs and put in a very pretty jar. But she wanted to be on the highest shelf so she could watch over me and Hermes. I promised I’d do that for her. Terri called to tell me that Isis came to her and said that all she felt was a jolt and then she was outside her body running and jumping like she was able to when she was young. She’d already visited Hermes and he commented that he’d not seen her so active for quite some time and he was glad she was so happy. She also said that if I saw Hermes staring at what appeared to be nothing and then look up – it was Isis’ spirit. She’d be with us for a while. Hermes told Terri that it was “all about him now.” He suspected that mom would want to get another dog (so right) but he wants some alone time first. Then he wants a small one like him – a girl – and he wants to pick her out just like Isis picked him. He’s such a control freak . • how she’d slowly mount the steps Ed made to get on the bed with me. I’d see her face peek over the edge of the bed then she’d gingerly climb on, circle until she found just the right spot and press up against my body. I really missed that last night. • the way she loved people – especially people who’d give her scratches or had treats. She had no shame. She’d stick her nose up the inside of a man’s shorts to get to the cookies in his pocket. Please help Hermes and me remember her with love and humor. We miss her sooooo much. The CD is playing “Smile” right now – “smile though your heart is breaking.” I’m trying – but it’s so hard. She was a very special, unique dog who brought great joy to me and everyone who knew her. Rest in Peace my precious Isis. Greetings from Kindred Spirit Animal Rescue Center AKA Ripley County Humane Society. Our facility is located in the small rural community of Fairdealing, Missouri. Our community of 1400 residents is about 25 minutes southwest of Poplar Bluff. We wanted to tell you about ourselves and how Kindred Spirit came to be. We are Hank and Della Hadley. Growing up in western New York in a small community, Della and I were always around animals. We married in 1992. I have four grown children and Della has two. Our six children have blessed us with a total of 11 grandchildren. Della has been a day care teacher for the past 15 years. Della is employed with Early Head Start in Poplar Bluff. In 1994, we moved to Sarasota, Florida to care for my ailing mother. I had been in a wheelchair for about five years due to MS and multiple back surgeries. After undergoing six years of therapy and the persistence of a dear friend, Sophia Cryer and E.F.T. (Emotional Freedoms Techniques) I became able to walk with the assistance of forearm crutches. Today, I am crutches free. 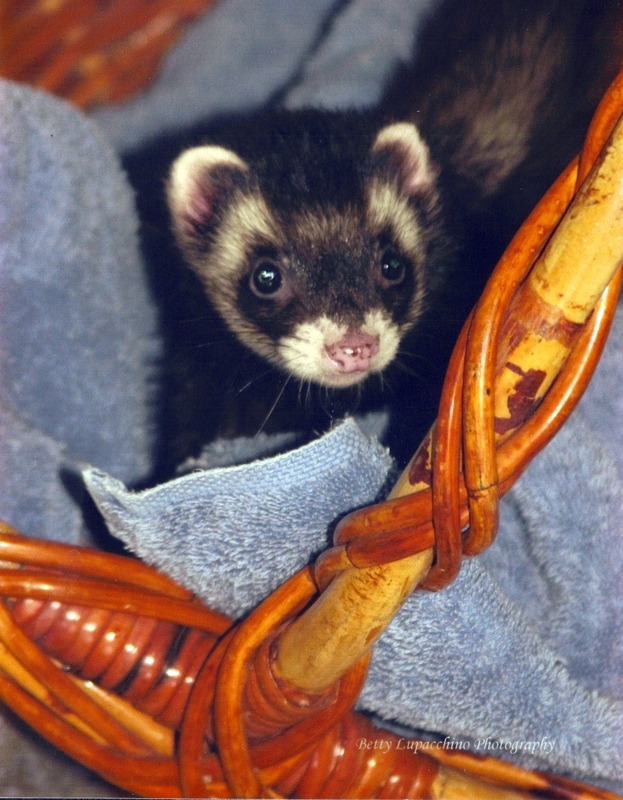 In 2004, I went to The Humane Society of Sarasota County, Inc. to offer my time as a volunteer. At first they were afraid that I would hurt myself or scare the animals with my crutches. Well, I was able to convince them to let me try and they gave me the okay which started me and Della on our journey of working with shelter and rescue animals. I began going to the shelter one or two days a week. Soon I found myself there everyday walking the dogs and spending time with them and the cats. The following year, the Kennel Manager offered me a job to help clean the kennels and feed the animals. Of course, I jumped at the chance. I loved my job and learned so much from the staff at HSSC. Soon after, I was given the position of Receiving Department clerk handling all of the intakes of the animals being surrendered for adoption by their owners. I was then promoted to Assistant Kennel Manager. In 2007, I was promoted to the position of Kennel Manager. Over the years, Della and I had been to Missouri several times to visit friends on our vacations. We fell in love with the area. During our visits, Della and I recognized the need for an animal rescue in this part of southeast Missouri. After several long talks, we decided to give up everything in Florida and to move to Fairdealing where we established Kindred Spirit Animal Rescue Center. It was challenging for us in the beginning. At first, people were not very accepting of us and the job pay was about half of what we had been use to making while living in Florida. We were both working full-time at the same time getting the rescue up and running. But we pushed on and in 2008 we received our State Agriculture Animal Care Facility License, incorporated, and received our State Tax Exemption. In 2009 we received our Federal IRS 501(c)(3) Tax Exempt status as a Not-for-Profit Animal Rescue, and in 2010 we added the state registered name, The Ripley CountyHumane Society. It has been a hard road for us personally. In our first year, Della and I put over $10,000 of our own money into the rescue. We created a wish list flyer to distribute in our small community. We were looking for simple items like bleach, paper towels, old blankets and towels, food for the animals, etc. We didn’t receive much help but once the community knew Kindred Spirit Animal Rescue Center was open we started finding animals just dumped in our yard. We knew that was what we were here for and accepted the animals never knowing where they had come from. One of the best things that happened for us in our first year was meeting Dr. Ginger Segraves, our veterinarian. Dr. Segraves and her Awsome Staff have been great supporters and she is worth the 35 minutes drive whenever the animals need her. There have been many times that we have gone without to make sure that the animals we have taken in receive the proper care they so deserve. During 2009, we used an additional $8,000 of our personal funds to make sure Kindred Spirit continued moving forward. If it had not been for the support both financially and morally from our wonderful family and so many of our dear friends in Florida that believed we could do this, Kindred Spirit would have never succeeded. We thank them all for their love and support and believing in our dream as much as we do. 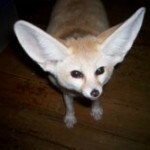 The continued need for financial support to keep Kindred Spirit Animal RescueCenter MOVING FORWARD is a given. We are so pleased that our supporters will now have the benefit of our receiving our 501 (c)(3) tax exempt status. All donations are now tax deductible. Our plans for the future include improvements to our barns, dog kennels and dog runs, plus a free-roaming cat building. We would love to set up a program to help families with low incomes or on assistance programs to be able to have their family pets spayed and neutered so they don’t have to give them up or find homes for the unwanted off-springs from their pets. We believe in what Kindred Spirit AnimalRescue Center is doing for our community and their animals. We know with your support we will be able to continue to do this needed and very important work that we so believe in. Story: It was a year ago March that an unknown kitty was spotted in my driveway. Me and a friend were on our way out on a walk and said to each other “have you ever seen that cat?”. No we both agreed. 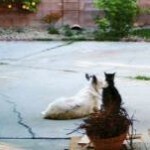 It wasn’t long before my dog Chloe spotted the kitty under the deck in the front of the house. I just told Chloe to leave the poor kitty alone and come in. She did, she is the best dog ever. The next day I spotted the kitty under my back deck. He was a beautiful seal point siamese but I really hadn’t gotten a good look at him yet. He stayed under the deck in the back. So I started to put some food out for him. The food was being eaten but not by him. I didn’t know this for a few more days. 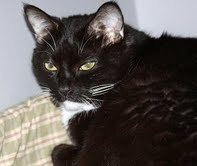 It was late one evening, we had all went to bed except for my cat Raven. She was up doing her usual late night cat stuff. We were soon getting out of bed because of the horrible meowing and growling Raven was doing. I was sure there was a raccoon or something on the deck. Raven was behind the curtain at the sliding glass door. I turned on the light and low and behold there was that kitty. I went out on the deck and he didn’t try to run or anything. I thought that was a bit strange so I approached him and it became very obvious that this kitty was blind and very skinny. So the next day the kitty went to the vet where many a test were run. All looked good except for a really bad mouth and very thin. Well, those were things that could be fixed so he came home with me and was introduced to the rest of the pet family. I have a blind, 16 year old Doxie named Brownie and for a few days he and the kitty just kept bumping in to one another as they wandered around smelling. He was a restless cat. He wanted in then out and in then out so this is where he got his name, Rum Tum Tugger from the play Cats. Rum Tum Tugger was always on the wrong side of any door…lol so was poor old Tug. And he was an older kitty not sure how old but old. He was in some sad shape but after a good dental and a lot of really really good food served to him every time he entered the kitchen he began to gain some weight.